More info:Price depends on cabin choice. Plus port tax 79 Euros per person. This luxury Dubrovnik cruise takes you to the best of Croatia’s coastline on a modern new motor yacht. You’ll spend eight days cruising the waters on a vessel that’s small enough to access the ports and bays that larger ships are unable to reach. Staffed by a Croatian captain and crew, the ship holds a maximum of 36 passengers and comes complete with a restaurant, an on-deck jacuzzi and a swimming platform. You’ll spend around four hours cruising each day, leaving plenty of time for sightseeing, swimming and wine tasting. Your journey will take you to secluded beaches, islands and fishing villages, as well as famous medieval towns and islands, including Hvar, Split and Korcula, where you’ll have the option of exploring along or taking guided walks. Breakfast and lunch are included, but the evenings will be free, so you can sample the many excellent bars and restaurants along the coast. This vessel is owned and sailed by the captain of the vessel, and he is passionate about raising awareness of environmental, economic and sustainable tourism policies in Croatia. He believes the promotion of environmental awareness in the region will have a prolonged and positive impact on the livelihoods of the local people and maintain Croatia as a sustainable tourism destination for future generations. It is vital sustainable tourism is embraced in Croatia to preserve its natural beauty as well as protect local stakeholders. The captain and his crew and their families rely 100% on the beauty of Croatia to attract tourism and provide them with a living, so they are more aware than anyone of the importance of maintaining their environment. They take important steps to maintain the environment: No waste product of any sort is ejected overboard, solid, liquid, food waste or anything at all. You can see the benefit of this, even when in harbour you will see fish and other marine life around the boat that can only exist in clean water. Clients food is all sourced locally, which, apart from providing an economic benefit to the local communities, reduces the food miles required. Being a modern ship, launched in 2016, with modern engines, fuel consumption is kept to a minimum and emissions are minimised. They will share the responsibility to protect the environment, customs and traditions of the region with our guests and find this is appreciated as they gain knowledge and receive a culturally diverse experience whilst travelling. It’s extremely difficult to pin point just one thing. We loved the ship, crew, ports of call, excursions and of course our fellow passengers, we were very lucky to have shared such fun with them all! Take your own hairdryer - the one in the cabin bathroom is worse than useless! !Relax and enjoy, go with the flow! Certainly it benefited local people - not sure how the trip reduced environmental impacts or supported conservation other than making us more aware of our beautiful surroundings and wanting to maintain their beauty. 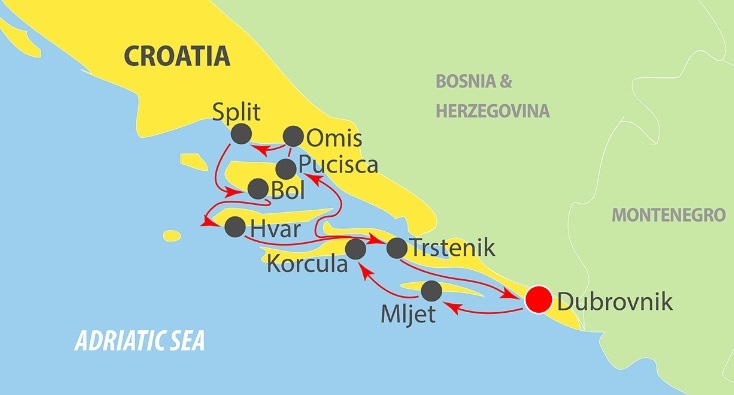 We had a fabulous time and as first time visitors to Croatia felt that small ship cruising was the best way to see most during our seven days. The whole experience was amazing. Mixing with people from all over the world was wonderful and educational. Everyone was friendly and inclusive which was great for me as I was travelling alone. The ship was well run and managed. Staff were friendly, helpful and knowledgeable. The cabin and facilities were comefortable, clean and well looked after. Food was excellent. Scenery was spectacular and the guided tours were informative. It was all that I hoped it would be. Shorts, swimsuits and comfortable footwear is all you need. Oh and a willingness to join in, relax, get to know your fellow travellers and have fun. Definitely take your camera too!